There is no second thought that calendars are extremely useful in daily life. They help us to know the exact month, date & year. Businesses have learned to use it for their advantage as they have come with their own poster calendar. It has turned to be very effective marketing strategy. Apart from letting the customer know about the day & date, business calendar is an effective tool for business promotion. The poster calendars are bigger than the regular calendars. They have attractive photographs of the product along with month wise calendar. Some companies go for 12 pages calendars each having a different picture for every month along with the name of the company and logo. 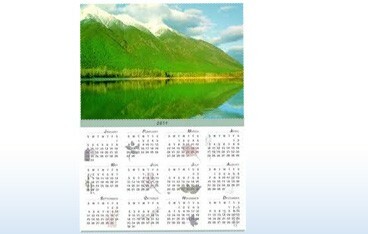 Photographs & graphic plays a vital role in these calendars. Make sure, you choose these pictures carefully; it has to eye catching, go for artistically taken photographs of your brand ambassador, products, or fascinating graphic. Some companies have made this a big feature, sometimes big celebrities and models are seen competing to get a space in the calendar. In case, you are looking for a rich quality poster Calendar Printing Services then your search is going to end at S S Graphics . We understand the nuances of poster printing. We use high quality paper and latest printing technology to come up with a lavish looking poster calendars that will make a special place for your product and services in the customer’s hearts. Poster Calenders printing is one of the fastest methods of reaching masses in a short time at a lesser cost. S S Graphics can make all the difference in your poster calenders printing with its creative design and excellent printing services making the poster calenders even more eye-catching . We make sure that the customer is engaged and your message is conveyed to him in an effective and appealing manner. Bulk poster calenders come in several popular sizes as per their uses namely promotional signage. Glossy poster calenders bring out the colors in your images, and are great for reproducing detailed photos. Our semi-gloss posters have a soft shine. Size : Choose an Option... 9" X 14" 11" X 17" 14" X 19" 17" X 22" 17" X 24" 19" X 28"